The meteoric rise of the largest unregulated financial market in the world-for contemporary art-is driven by a few passionate, guileful, and very hard-nosed dealers. They can make and break careers and fortunes. The contemporary art market is an international juggernaut, throwing off multimillion-dollar deals as wealthy buyers move from fair to fair, auction to auction, party to glittering party. But none of it would happen without the dealers-the tastemakers who back emerging artists and steer them to success, often to see them picked off by a rival. Dealers operate within a private world of handshake agreements, negotiating for the highest commissions. Michael Shnayerson, a longtime contributing editor to Vanity Fair, writes the first ever definitive history of their activities. He has spoken to all of today's so-called mega dealers-Larry Gagosian, David Zwirner, Arne and Marc Glimcher, and Iwan Wirth-along with dozens of other dealers-from Irving Blum to Gavin Brown-who worked with the greatest artists of their times: Jackson Pollock, Andy Warhol, Cy Twombly, and more. This kaleidoscopic history begins in the mid-1940s in genteel poverty with a scattering of galleries in midtown Manhattan, takes us through the ramshackle 1950s studios of Coenties Slip, the hipster locations in SoHo and Chelsea, London's Bond Street, and across the terraces of Art Basel until today. Now, dealers and auctioneers are seeking the first billion-dollar painting. It hasn't happened yet, but they are confident they can push the price there soon. As a biographer, you can look a long time for a subject as compelling as Andrew Cuomo. It’s not just that he’s governor of New York, or that he wants to be president. It’s that he’s such a brooding, complex guy. Most American politicians give you that phony smile and slick line of patter. Not Andrew. He’s intense. You get the feeling he doesn’t even like the retail politics of shaking hands and kissing babies. What he likes is using political power to whip the state into shape. My book is the first biography of him. It’s candid and unauthorized, which is to say that not all of the 300-plus people I interviewed had flattering stories to tell. I think the picture that emerges is ultimately a positive one. But you can be the judge of that. Andrew Cuomo is the most tantalizing politician of his generation – a boldly successful governor of New York with thinly veiled aspirations to win the presidency. As a leader, he’s proven he can work with lawmakers of both parties – and quash any who stand in his way. Fierce, machinating, and not a little scary, he’s used his power to make harsh cuts and balance the budget, pleasing conservatives, yet also rammed through bills of national consequence for marriage equality and tighter gun control, thrilling progressives. Against his greatest challenge – widespread corruption in America’s most dysfunctional state capital – he’s struggled, and made more than one misstep. But with his second term just begun, he may yet prevail – and set himself on course for the Oval Office at last. I was asked by Assouline, the glam publisher of high-society coffeetable books, to write an essay that would accompany a picture book to be called “The Big Book of the Hamptons.” It was fun, because they let me write what I felt about the Hamptons, my home off and on for much of my 60 years. Like anyone who’s lived out east for a long time, there is much to rail about and criticize now: the endless onslaught of hedge funders in fancy cars building megamansions on once-quiet country lanes. But somehow the Hamptons manages to absorb them all without losing its innate beauty. I couldn’t help but be struck by an irony, when I first saw the book. Instead of the three years I usually spend on a book, I had spent a week or so writing the essay that introduced the pictures that followed. Yet it was the heaviest book I’d ever published! At least eight or ten pounds! And with a very, very orange cover. Possibly the orangest book cover ever created. Therein unfolded one of the most rewarding and memorable – and just downright fun – assignments any journalist could hope to have. Every week, I went over to Harry’s apartment on the Upper West Side for two or three hours of marvelous stories. Stories about growing up desperately poor in Harlem and Jamaica. Stories of serving in a segregated U.S. Navy in World War II, and of going back home with no better prospect than to be a janitor. Stories of stumbling into a Harlem theatre where real acting was happening, and seizing on that as a life-saving goal. Stories of finding, almost by accident, that he had a singing voice people wanted to hear, and then rocketing up in a few breathtaking months from fill-in singer in a Broadway jazz club to a national – and then global – sensation. The amazing thing about Harry’s life is that it’s not just one outsized, extraordinary life worthy of a full-length biography. It’s two! For starting in the late l950s, Harry began using his newfound celebrity to get out the word for civil rights. That, in turn, led him to a close and abiding friendship with the young Dr. Martin Luther King, and to a role beside King in all the great civil rights battlegrounds that changed the country. “My Song: A Memoir of Art, Race and Defiance” was first published by Knopf in the fall of 2011, and is now in paperback from Vintage. Three years later, Harry’s story - and its backdrop of the civil rights movement - is still reverberating. The Oscar-nominated movie “Selma” vividly depicts the 1965 march from Selma to Montgomery, Alabama, when scores of marchers were beaten and gassed on the Edmund Pettus Bridge. Harry’s contribution in bringing world-famous entertainers to cheer and inspire the marchers is noted in the movie, which also includes a lovely still shot of a grinning Harry on the triumphant third day of the march. At the same time, “Selma” has stirred controversy and criticism for its portrayal of President Lyndon Baines Johnson in dealings with Dr. King. The movie shows Johnson as furious with King for staging the march, and doing all he can to thwart King. I asked Harry not long ago what he thought of Johnson during the Selma chapter. He, like many historians, believes Johnson wanted Selma to succeed as much as King did. Back in 2004, I was drawn down to southern West Virginia to follow a story so appalling that anyone who hadn’t seen it up close couldn’t believe it. Coal companies were blasting the mountains, decapitating them for coal. The forested ridge tops and valley streams of Appalachia – one of the country’s natural treasures – were being destroyed, along with towns and communities. An entire culture was disappearing. Amid the mountain towns on winding Route 3, I met West Virginians mobilizing as best they could to fight the destruction of their world. I also met a young environmental lawyer, Joe Lovett, flinging lawsuits against the coal industry and the federal government to try to stop the madness. And eventually I met the villain of the tale, Don Blankenship, CEO of Massey Energy, then the largest coal company in Appalachia – and the most rapacious. “Coal River,” which came out in early 2008, was the first book to draw national attention to the issue. As of early 2015, mountaintop coal removal is still occurring every day in that devastated land. Joe Lovett is still fighting the industry; his new non-profit is Appalachian Mountain Advocates. But Don Blankenship is no longer riding his miners to maximize coal production at the expense of safety and lives. It was in April 2010 that the mine at Upper Big Branch blew. Massey was notorious for skirting safety practices, and Blankenship set the corporate tone, speechifying on the virtues of American capitalism as he saw it, a brand of capitalism in which workers, as he once put it, were tools: when one broke, you just got another. That April day, in a mine riddled with safety violations, a spark set off a methane explosion that killed 29 miners: all but two on duty in the two miles of underground tunnels that filled with explosive gases and coal dust. Blankenship denied that Massey was at fault in any way; he denied personal culpability too. As political pressure mounted, however, he was forced to resign, and Massey was sold to Alpha Natural Resources, burying the controversial name. Our aim was to talk to prominent doctors and scientists on the front lines of this invisible war, as well as to patients who’d survived some of the most horrifying resistant bugs. By and large, that’s what we did. Our travels took us to the former Soviet republic of Georgia, for example, where a long-ago-discarded antibiotic shows signs of new usefulness; to the Midwest, to interview the mother of a victim of flesh-eating bacteria; and to Paris, where Mark interviewed one of the world’s best known doctors on the subject. Both of us were hoping to go to Indonesia to see giant Komodo dragons, whose saliva may contain potent new antibiotics, but our publishing budget didn’t quite get us there. A dozen years later, the global threat of drug-resistant bacteria is only more pressing, the standard antibiotics only more vulnerable to new, resistant bacterial strains. Just this week – January 22, 2015 – comes word in Science Daily that some of the most alarming resistant strains are found in giant feedlots, called CAFOs, where thousands of feed animals are housed in tight and often unsanitary quarters. My first book came by serendipity. Over drinks with a woman named Bodil Nielsen, I shared my hope that I might write a book. But about what? I had no idea. “Why don’t you write Irwin Shaw’s biography,” Bodil said. Somehow I sensed it was better not to say what I was thinking: who’s Irwin Shaw? Instead, I nodded sagely, and listened as Bodil told me snippets of her years as the girlfriend of this marvelous American writer who had died in 1984, a year or so before our drinks. I started reading Shaw’s best-known novel, “The Young Lions,” and soon moved on to others: “The Troubled Air,” “Two Weeks in Another Town,” and more. I devoured the short stories that had enlivened the New Yorker in the same years that John Cheever and John Updike were creating such a memorable canon of American short stories. Shaw’s stories, I realized, were as good as anything Cheever and Updike had done. “The Girls in Their Summer Dresses” and “The Eighty-Yard Run” were the most celebrated, but there were dozens more that sparkled as brightly. Most of all, I feel sentimental about Irwin. I never met him, but living with him in my head for almost three years, I feel I almost did. I love how warm and ebullient he was, what a life-seizing big bear of a guy he was, how talented and determined he was – writing every day without fail, no matter how hung over he might be. The critics’ consensus is that Irwin squandered his gifts, going from his early successes to lucrative screenplays and more commercial novels that floated a fancy life in Europe, Los Angeles and, later, Southampton. It’s true that high living got the better of him eventually, and the later work wasn’t that great. But he leaves, nonetheless, a remarkable shelf of first-rate novels and stories that together paint a vivid picture of mid-twentieth-century America. And his early, dramatic rise from poverty to literary success, followed by the colorful war years that inspired “The Young Lions” and some of his best stories, remains a remarkable saga. More often than you’d think, writers find their next book ideas in some small newspaper article that sparks their curiosity. So it was for me one day in the early 1990s when I read about a top-secret program at General Motors to design and produce the world’s first really sleek and fast electric vehicle. I wasn’t an automotive journalist. I just marveled at how world-changing a mass-produced electric vehicle would be. So I picked up the phone, called GM, and asked if I could be allowed to follow the company’s electric vehicle program from the inside – from “dream to gleam,” as car buffs put it. Nearly 20 years later, of course, the EV is anything but dead – though GM, I’m afraid, gets far less of the credit than it would have if it had kept its pedal to the metal with the EV-1. Instead, the laurels go to bold pioneers like Elon Musk, whose Tesla EVs delivered on the promise of EV-1, even as Musk met the equally epic challenge of establishing the country’s first large-scale automotive production operation in nearly a century. 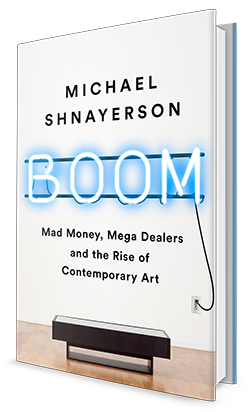 “Shnayerson, a contributing editor at Vanity Fair, recreates a remarkable, inspiring saga of glitches, unexpected setbacks, power struggles and ingenuity, and in doing so he tells how GM, once stagnant, resistant to technological change and battered by foreign rivals, staged a comeback.” -Publishers Weekly.